Who says that French royalty cannot breed with ordinary native Americans? Crimson Cabernet’s parentage combines the Bordeaux King of Grapes, Cabernet Sauvignon, and the State Grape of Missouri, Norton. The result is a disease resistant, cold hardy hybrid grape with genes that trace back to 18th century Chateau Mouton. 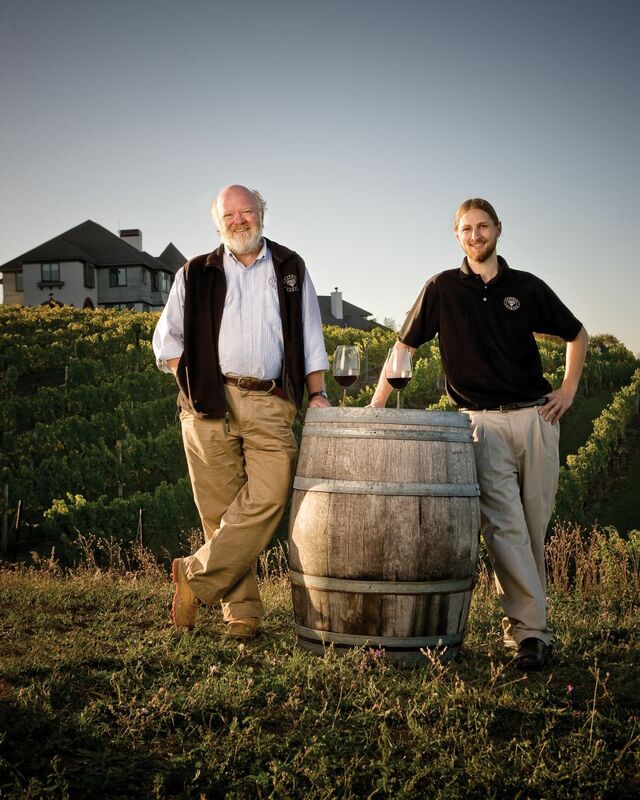 In October 2011, after nine months in new American oak barrels, Somerset Ridge Vineyard & Winery in Kansas, released its 2010 Barrel Reserve Crimson Cabernet. That made Dressel’s creation the first commercially bottled and released Norton-Cabernet Sauvignon cross. Following research and plantings that began in the late 1990s, the variety was created in 2002 by Dressel’s privately owned corporation, Davis Viticultural Research, based in California. The grape breeder says he was assisted by the US Department of Agriculture and legendary grapevine geneticist, the late Dr. Harold Olmo. In 2006 Crimson Cabernet was registered as a trademark and is now growing in 20 states including Illinois, Indiana, Kansas, Kentucky, Michigan and Missouri in the Midwest. Speaking at the recent Kansas Wine Conference in Topeka, Dressel said his cross ‘really does combine the best features of Cabernet Sauvignon and Norton.” Based on versions made in Illinois, Kansas and Kentucky, Dressel says Crimson Cabernet wines tend to have the color of a Cabernet, a classic vinifera flavor and taste something like a full bodied, big Spanish red. However, he says the grape is particularly expressive of terroir and can taste quite different depending on where it is grown. Dressel is not the first to cross Norton with vinifera. Professional and amateur grape breeders have crossed the two varieties for many years. Professor Wenping Qiu, from Missouri State University’s Center for Grapevine Biotechnology, created a Norton-Cabernet Sauvignon cross in 2005 to study the genetics behind the Norton’s unusual disease resistance. The Professor says progenies from those vines and other Norton crosses are growing in a test plot and will be ready for a possible commercial release after genetic and wine quality studies finish in five or six years time. In contrast, the passage from creation to market for the Davis Viticultural Research cross has been comparatively swift. 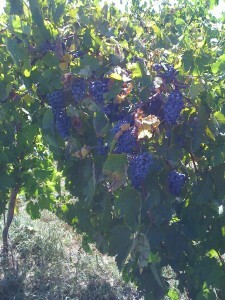 The patented variety was being sold to vineyards in 2007. A year earlier, Crimson Cabernet’s winter capabilities were tested in western central Illinois. 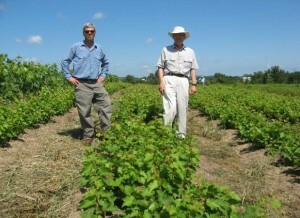 An acre-and-a-half of grapevines were planted on the flat, former Illinois corn field. ‘Crimson Cabernet did beautifully well, it was one of our outstanding vines.” says Dressel. Temperatures there dropped to 12 below zero, and in Missouri, says Dressel, the vines have endured 17 below without showing any signs of winter damage. On the Davis Viticultural Research website it says the grapes harvested from this plot in mid-September 2006 had Brix of 22.5, pH at 3.32 and acid levels of 7.75. Part of the reason for this success in cold climates is Crimson Cabernet’s thick canopy of leaves. In this respect, says Dressel, the leaves are not only sugar factories, but also act like an anti-freeze, protecting the buds from getting too cold. The variety’s cold-hardiness — and resistance to disease — is supported by Somerset Ridge Winery winemakers Cindy and Dennis Reynolds. 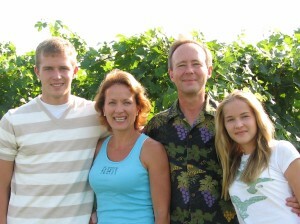 Somerset Winery is located in Paola, Kansas which is 20 miles south of Kansas City. The vines have Norton’s cold-hardiness and disease resistance but not its sometimes difficult to control vigor. Crimson Cabernet vines grow in an orderly fashion with very straight trunks of uniform thickness. The wood — like many cold climate grapevines – hardens off early, turning brown evenly. ‘Another feature is the vine won’t bear more than it can handle.” Dressel says some hybrids – like Seyval – are notorious for bearing a bumper crop one year that can bring the plant to a state of collapse the next. At 4 tons per acre, grape yields are higher than Norton’s average of about 3.5 tons and Dressel says this amount ensures good grape quality. In size, the grapes are roughly midway between the small Norton grape and the larger Cabernet Sauvignon. Crimson Cabernet doesn’t have the acid and juice issues of its Norton parent according to the grape breeder. High acidity can make handling Norton and producing a quality dry red tricky. The result can be a sour tasting wine. When Crimson Cabernet is crushed, the mush is juicier and less seedy than Norton. ‘Anything’s more juicy than Norton! Norton is just so full of seeds!” says Dressel. ‘It [Crimson Cabernet] really just works like a normal grape, you wouldn’t know you were working with anything that had Norton in it. We always had problems getting Norton through the pump because it was just so thick! You don’t have any of those problems fortunately.” He says pH levels usually measure 3.5 or 3.6. There are other signs that the grape is already producing quality wine. Somerset Ridge’s Crimson Cabernet is so popular it’s sold out – so unfortunately there was none to offer Midwest Wine Press during tastings at the recent Kansas Winemakers conference in Topeka! At wine expert Doug Frost’s 2012 Jefferson Cup Invitational Wine Competition, the Somerset Ridge wine won a Medal of Excellence. This award is regarded by judges as roughly equivalent to a gold medal in other competitions. Previous story What is the Legacy of Your Winery?